An astounding international cellist and educator, Simona Barbu has traveled to Europe, Asia, and the United States as a soloist, chamber musician, clinician, and most recently she held residencies at conservatories and universities in China (Shanghai, Beijing, Guangzhou, Zhengzhou, Wenzhou and Hong Kong), in Hungary (Budapest and Kecskemet) and Romania (Timisoara and Cluj). She has also been an active orchestral musician, performing with Memphis Symphony Orchestra, South Dakota Symphony, Fargo Moorhead Symphony Orchestra, and serving as principal with the Eroica Ensemble in Memphis, Starkville Symphony Orchestra, Greater Grand Forks Symphony Orchestra and Bismarck-Mandan Symphony Orchestra. Simona Barbu began her musical studies at age five and gained public attention as a member of the leading string quartet of the Conservatory of Timisoara in her native Romania, where she made her solo debut in Tchaikovsky’s Variations on a Rococo Theme with the Music Conservatory’s symphonic orchestra. After graduating from her undergraduate as the Music Conservatory valedictorian from Lynn University in Florida, Dr. Barbu continued her graduate studies with a Master of Music in Cello Performance at Southern Methodist University under the tutelage of Nathaniel Rosen and Christopher Adkins. Subsequently, she earned the Doctor of Musical Arts degree at the University of Memphis where she studied with professor Leonardo Altino. She has performed in master classes with Janos Starker, Lynn Harrell, Aldo Parisot, Pieter Wispelwey, Carol Ou, Timothy Eddy, Amit Peled and Yehuda Hanani. A dedicated teacher, Dr. Barbu has served as a faculty member at Mississippi State University for four years (2007-2011), where she taught strings, coached string chamber ensembles, and conducted the symphonic orchestra. In 2011, Dr. Barbu was appointed Assistant Professor of Cello and Burgum Endowed Chair at the University of North Dakota, where she currently teaches cello, string bass and chamber music. 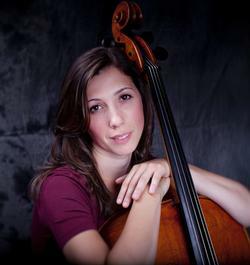 During summers, she is a cello faculty at MasterWorks Festival in Ohio.